The Valley Individual Development Account (VIDA) program provides training and support to people as they save for ma jor life and financial goals. 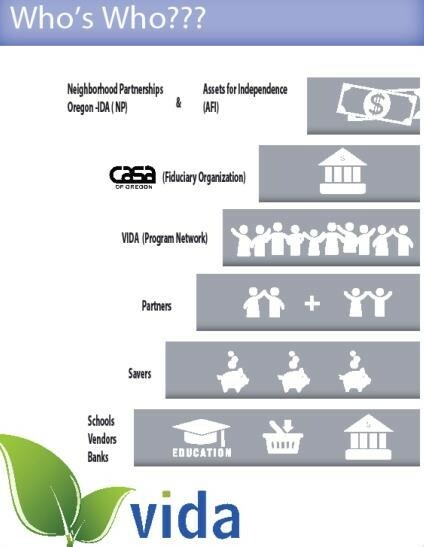 VIDA is a partnership between CASA of Oregon and member agencies. What is an Individual Development Account? An IDA is a matched savings account available to individuals with limited resources and that can be used for specific assets. IDAs require regular monthly deposits, financial education, and training for your asset. IDAs are case managed by IDA specialists. Why save with an IDA? What can I save for with an IDA? How much can I save with an IDA? TIP: If you save the maximum of $3,000 over 3 years, that’s $9,000 in matching funds!